Clean, and rinse the birds. Remove the pit from the prune if necessary, and replace with a peeled clove of garlic. Place the stuffed prune inside the bird’s cavity. Rub the birds with the rub…that’s why the call it a rub….get it in their good, between the wings, down the legs. 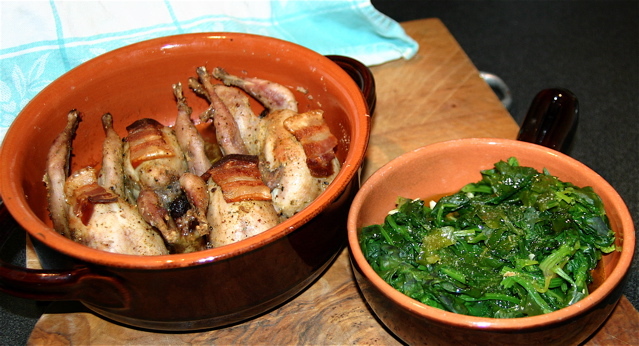 Arrange the birds in a roasting dish and cover with a small piece of bacon or pancetta. Add a small amount of chicken stock, about 1/2 deep in the bottom of the pan. Cover the roasting pan, and roast the birds at 350F for about 30 minutes, uncover and raise the heat to 400F for the last 15 minutes. mmmmm…….